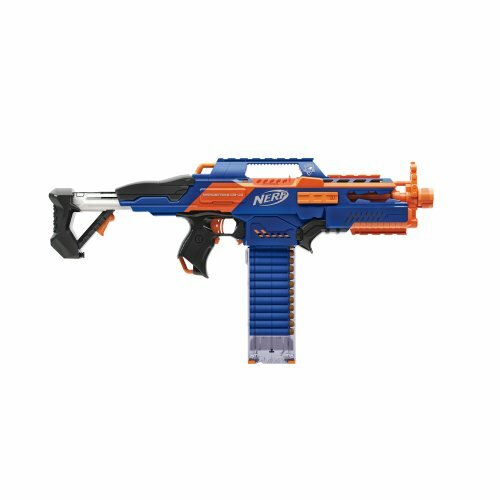 If you are excited by Rapid Fire technology with a huge clip to pummel your enemies into submission then we recommend The Nerf N-Strike Elite Rapidstrike CS-18 Blaster. The Nerf Rapidstrike CS-18 Blaster has a magazine capacity of 18 darts. The gun contains an Acceleration Trigger which is a nice and rare addition in the elite line. This gun has a range of about 76 feet. The gun needs four C batteries to operate. The gun has clip which is see through so you can instantly check how much ammo you have left (very useful for long combat and allows you to stay one step ahead). Hint: click or tap the stars for the most helpful Nerf RapidStrike CS-18 Amazon reviews. Nerf RapidStrike CS-18 range test coming soon! Get the RapidStrike CS-18 Mod Guide!